Love noshing on cauliflower rice but simply can't be bothered with pulling out your bulky food processor to make it from scratch? You're not the only one. Luckily, Costco has a mess-free alternative that's easy on the wallet and able to satisfy your low-carb stir-fry cravings in a pinch. 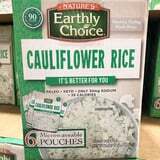 Select locations of the wholesale retailer are selling pouches of Nature's Earthly Choice cauliflower rice - in bulk, of course. Each box contains six convenient 8.5-ounce packages that you simply pop in the microwave for 90 seconds before enjoying. The best part? You only have to fork over $10 for a week's worth of the low-calorie, keto-friendly rice alternative. You're the real MVP, Costco. Speaking of calories, let's take a look at exactly how many are in each serving, shall we? Below is a full breakdown of the nutrition information for each half-cup serving (aka roughly half a pouch).